Updates on Bagyong Lando, a tropical storm, as reported by the state weather bureau PAGASA on Thursday, October 15, 2015, are posted here. In its 11 a.m. bulletin, the weather agency said Lando has slighlty intensified as it continues to move in a westward direction. At 10 a.m. today, the tropical storm was spotted 1,055 kilometers East of Baler, Aurora, packing maximum sustained winds of 75 kilometers per hour near the center and gusts of up to 90 kph. It is moving West at 17 kph. No public storm warning signal has been issued. The estimated rainfall amount is from moderate to heavy within the 500-km diameter of the tropical storm, PAGASA said, adding that fisher folk are advised not to venture out over the seaboards of Northern Luzon and over the eastern seaboard of Central and Southern Luzon. 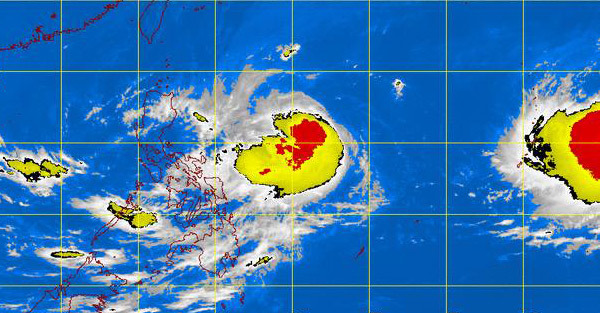 State forecasters said the northeast monsoon is affecting Northern and Central Luzon. Cloudy skies with light rains will be experienced over Cordillera, Ilocos region, Cagayan Valley and Central Luzon while light to moderate rains and isolated thunderstorms over Metro Manila, Bicol region and the provinces of Rizal, Quezon and Samar. Partly cloudy to cloudy skies with isolated thunderstorms will prevail over the rest of the country, the weather agency reported. Moderate to strong winds blowing from the northeast to northwest will prevail over Luzon and Eastern Visayas and the coastal waters along these areas will be moderate to rough. Elsewhere, winds will be light to moderate coming from the northeast to northwest with slight to moderate seas, PAGASA added.